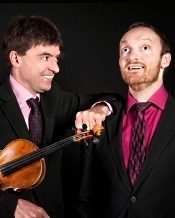 Volker Reinhold, violin; Ralph Zedler, piano. MDG 903 1819-6. First, a word about the artists, about whom you may not know much. 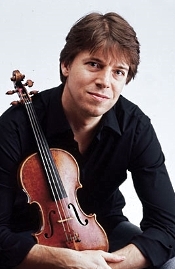 Since 1989 violinist Volker Reinhold has been the concertmaster of the Mecklenburg State Orchestra, which performs operas, operettas, musicals, ballet, and concerts at the Mecklenburg State Theater in Schwerin, Germany. According to his Web site, Mr. Reinhold "has gone on to perform a wide range of solo assignments and to dedicate himself intensively to chamber music. Additionally, for some years he has often assisted as a concertmaster with several Northern German orchestras. He has a special predilection for the virtuosic violin literature, above all Fritz Kreisler and also Pablo de Sarasate. He has incorporated practically all of the former's music into his repertoire. For many years he has performed successfully with his regular piano partner Ralph Zedler." Mr. Reinhold performs on a 'Mougeot,' a French violin from the nineteenth century." 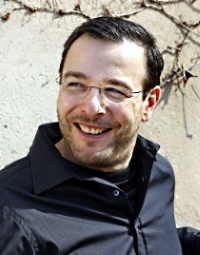 In 1999 pianist Ralph Zedler graduated from Staatliche Hochschule für Musik in Cologne. He worked regularly in the singing classes of Liselotte Hammes, Klesie Kelly, Kurt Moll, Edda Moser. From the autumn of 1999 to January 2011 Mr. Zedler was engaged at the Mecklenburg State Theatre in Schwerin as soloist and Ballettrepetitor, participating in over seventy productions of opera, operetta, musical, oratorio, and ballet. Since 2011 he has worked at capital Opera, the smallest Opera Berlin devoting himself to the repertoire of forgotten one-act plays. Mr. Zedler's concert career has taken him along with prominent figures such as singers Agnes Giebel, Ulrich Hielscher, Jean van Ree, and Edda Moser. 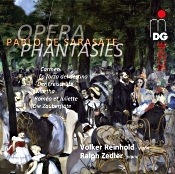 On the present album, Reinhold and Zedler devote themselves to six of the opera fantasies of the Spanish composer and virtuoso violinist Pablo de Sarasate (1844-1908). As you know, Sarasate loved to dazzle his audiences, and what better way to do so than by playing some of his own transcriptions of already famous music. The program Reinhold and Zedler present here includes concert-fantasy arrangements for violin and piano of Carmen (Bizet), Die Zauberflote (Mozart), Der Freischutz (Weber), Martha (Flotow), La forza del destino (Verdi), and Romeo et Juliette (Gounod). First up on the agenda is Sarasate's Concert Fantasy on Bizet's Carmen, as good a curtain raiser as any. Just don't expect a whiz-bang, gung-ho interpretation along the lines of a Ruggiero Ricci in his famous old Decca set. Reinhold and Zedler are more moderate than that; they don't try to generate a ton of excitement or dazzle the listener with their pyrotechnic skills. Their Carmen Fantasy sets the tone for the rest of the program by sounding traditional, well judged, thoughtful, and expressive. Now, this doesn't mean that the musicians don't have a good time with it. Indeed, it's all quite vital and pleasantly exhilarating. They simply don't go after the "wow" factor that must be so tempting in a work like this (although, to be fair, they end the piece in a flurry of emotional flair). And so it goes, with Reinhold's violin carrying the day and Zedler's piano accompaniment always lending firm support. I can't say I liked some of the more-literal passages they take, yet they more than make up for it with the tasteful sensitivity of their playing. As this is mostly opera music, the players ensure that we hear the singers behind the notes, the violin and piano doubling for any number of voices from quiet solos to big choral numbers. Of all the works on the disc, I think I enjoyed the Magic Flute Fantasy best of all. There's a delicacy as well as a zest about Mozart's music that Reinhold and Zedler capture brilliantly. Here, it also becomes clear that the two performers have been collaborating for years, their parts working beautifully, seamlessly, effortlessly together. Another thing the players do well is make these fantasies work as a whole. Under the sympathetic guidance of Reinhold and Zedler these are not merely medley pastiches of starts and stops on familiar tunes. Instead, each fantasy sounds like a self-contained work with flawless transitions to help it appear all of a piece. Fascinating. Producers Werner Dabringhaus and Reimund Grimm and recording and mixing engineer Holger Schlegel made the album in just about every audio format you can think of on a single disc: CD, SACD, DVD, 2.0, 5.1, and 2+2+2. OK, that last one got me, too. Unfamiliar with the format and with no information about it in the accompanying booklet, I had to look it up. Turns out that 2+2+2 utilizes all six channels on an SACD layer to present music not just in two channels front and two channels back but two channels up and down as well. So 2+2+2 captures all the reflected sound of a musical event in a true three dimensions. However, I have my SACD player hooked up only in two channels, so that's the way I listened: first in two-channel SACD and then for a few minutes in regular two-channel CD. In these modes, the sound was quite good. I can only imagine how much more interesting 2+2+2 might be. Anyway, the two-channel stereo is very dynamic, with huge outbursts from the piano especially. It's never more or less than natural, and it makes a vivid impression on the listener. The engineers have picked up the room ambience nicely, with a mild and unobtrusive resonance lending a lifelike air to the proceedings. There is also a pleasing bloom on the instruments that further lends to the realism of the presentation. Cecile Licad, piano. Naxos 8.559145. 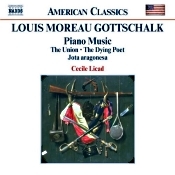 People used to call the American pianist and composer Louis Moreau Gottschalk (1829-1869) the "Chopin of the Creoles," and for good reason. He was not only a sensation in the U.S., he was the toast of Europe and much acclaimed by Frederic Chopin. Gottschalk's New Orleans upbringing and Paris schooling were a perfect combination for the kind of then-new piano music he presented to his audiences, a half century foreshadowing ragtime, Scott Joplin, and jazz. Of the one hundred or so short piano pieces Gottschalk wrote, this disc includes sixteen of them, representing a varied roundup of his most-popular and most-influential works. 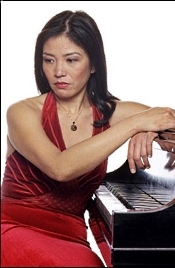 Filipina classical pianist Cecile Licad plays them with vigor, vivacity, and sensitivity, yet it's a performance style that may or may not have been what Gottschalk had in mind since there is no clear tradition of playing the man's music. By comparison, Alan Marks on a similar collection from Nimbus plays many of the same pieces at a slightly more traditional pace. In any event, Licad's sometimes leisurely, sometimes highly animated manner seems well suited to Gottschalk's more-lyrical and more-outgoing compositions. "Le Banjo," the piece that opens the recital, stands out for its expressive manner. So does "The Dying Poet," very well executed here for two reasons: Because the booklet note says it was the most-famous piano work of the Civil War era, an interesting facet of American musical life; and, as important, because it bears an uncanny resemblance to "After the Ball," the popular song Charles K. Harris wrote in 1892 using virtually the same melody. Well, copyright laws were nonexistent in those days and Gottschalk was long dead, so who was to complain? Among the other pieces in the collection are "Pasquinade," a forerunner of twentieth-century jazz tunes, and "The Union," a paraphrase of national airs like "The Star Spangled Banner," "Yankee Doodle," and "Hail Columbia." Ms. Licad plays them all with intelligence and grace, although, as I say, it remains a question whether pianists of Gottschalk's day would have played them as she does. The sound is very good, too, and one cannot go wrong for the modest price Naxos charges. However, while the Naxos disc sounds like a very good piano recording, the Nimbus disc I mentioned earlier sounds like a very good piano, period. There's more air and more natural sparkle to the Nimbus recording, elements that set it apart from the ordinary, even if the disc does cost considerably more than the Naxos product. Decisions, decisions, all of them good ones. 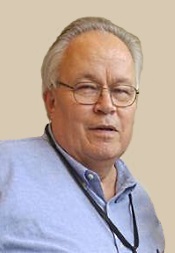 Sakari Oramo, Royal Stockholm Philharmonic Orchestra. BIS BIS-2028. You can always expect a solid performance from conductor Sakari Oramo, particularly when he's conducting his own orchestra, the Royal Stockholm Philharmonic. 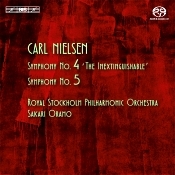 The question is whether Oramo's recording of Nielsen's Fourth and Fifth Symphonies is any better than a number of rivals who have already proved their worth, conductors like Blomstedt, Bernstein, Ormandy, Berglund, Horenstein, Jarvi, and others. The answer is a definitive, Who knows? Oramo's readings certainly appear competent, although I can't say they are as exciting, as sensitive, or as thoughtful as the ones from the competition. Carl Nielsen (1865-1931) was one of Denmark's most-prolific and distinguished composers, writing six symphonies, two operas, three concertos, and a ton of songs, hymns, cantatas, and orchestral, chamber, and keyboard music. He wrote his Symphony No. 4, Op. 29, in 1916 with the First World War raging in Europe, so you can expect it to be one of his more-dramatic works. He gave it the title "The Inextinguishable," a name he said referred to "that which is inextinguishable" or "the elemental will to live." Nielsen went on to say in a preface to his symphony that the piece expressed "the Elemental Will of Life." A few years later, he wrote, "If the whole world was destroyed, Nature would once again begin to beget new life and push forward with the strong and fine forces that are to be found in the very stuff of existence.... These 'Inextinguishable' forces are what I have tried to represent." Nielsen opens the symphony with a rather fiery, agitated Allegro, which Maestro Oramo handles well enough. It doesn't quite develop the kind of intensity I'd like, but the conductor does play up the differences in tempo nicely as the music swells, ebbs, and flows. Still, a little more tumult might have helped to establish the context of the conflicts. The second movement Poco Allegretto, which flows uninterrupted from the first movement, is a kind of tribute to peaceful, bucolic simplicity, the sort of quiet and tranquility Nature ultimately seeks. Here, Oramo well captures the mood and paints an appropriately sweet picture in leisurely style. The third and fourth movements return us to high drama, and it's here that I think I prefer Herbert Blomstedt (Decca) over Oramo. In the present performance, Oramo isn't quite as intense as Blomstedt, even though Oramo seems to move along at a slightly faster clip. I don't hear quite the emotional charge from Oramo that the music needs; instead, it appears more matter-of-fact, which isn't bad, mind you, just not as involving. That said, Oramo nonetheless concludes the symphony on a properly victorious note, with a glorious drum battle at its climax. Nature does, indeed, triumph in the end; the Earth abides. And Oramo has his day. Nielsen premiered his next symphony, No. 5, Op. 50, in 1922, and despite a rocky start with the public, it became one of his most popular compositions. Because he wrote it just after the close of the Great War, he included in it elements of contrast, good and evil, war and peace. Like No. 4, the symphony is obviously dramatic. Nielsen marked his Fifth Symphony in two movements and six segment notations: Tempo giusto, Adagio non troppo, Allegro, Presto, Andante un poco tranquillo, and Allegro, perhaps another indication of the somewhat enigmatic nature of the work. While the Fifth Symphony is obviously a direct outgrowth of the Fourth, the Fifth Symphony is also a force unto itself. Anyway, Oramo expresses the tone of the music as well as most anybody. It's a more atmospheric piece than Nielsen's previous symphony in that it conveys more differing states of mind, sometimes moving from one state to another in surprisingly jarring ways. Oramo maintains these transitions clearly yet smoothly, never allowing the music to sound merely like a series of starts and stops. Again, Oramo ensures that despite the music's rises and falls of energy, all ends in optimistic, life-affirming joy, the orchestra playing beautifully for him throughout. Producer Jens Braun and engineers Matthias Spitzbarth and Thore Brinkmann recorded the music at Stockholm Concert Hall, Stockholm, Sweden in August 2012 and June 2013 for hybrid CD and SACD playback. As usual with BIS, we get a fairly detailed, highly dynamic, and reasonably ambient sound, at least from the two-channel SACD layer to which I listened. It's a mite closer than I expected, though, slightly thinner, and a bit less dimensional in terms of depth. Nevertheless, these are minor concerns when the midrange transparency is so good and the overall impact so pronounced. Bass and treble extremes are adequate for the occasion, and the timpani sound splendid. 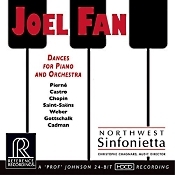 Joel Fan, piano; Christophe Chagnard, Northwest Sinfonietta. Reference Recordings RR-134. Sometimes I wonder how classical music fans manage to keep all the performers straight. I mean, I see monthly release sheets from every distributor of classical discs in the country, and I listen to five or six new recordings a week. Yet even I can't keep track of who is recording what or who the stars are. For example, when I received the present album from Reference Recording, I saw the name "Joel Fan" in big letters at the top. I had no idea if he was the composer or the soloist for the disc. I had to read the booklet to figure out that he is a talented young American pianist who has worked with Yo-Yo Ma and the Silk Road Project as well as debuting a few years ago on another Reference Recordings album. Anyway, on the current disc, Mr. Fan joins Maestro Christophe Chagnard and the Northwest Sinfonietta in a series of seven short dance numbers for piano and orchestra by composers Pierne, Herrera, Chopin, Saint-Saens, Weber, Gottschalk, and Cadman. Fan plays with considerable precision, the Northwest Sinfonietta lend him excellent support, and Reference Recordings produces its usual outstanding sound. According to Mr. Fan's Web site, he "is a graduate of Harvard College, received a Masters degree from Peabody Conservatory as a student of Leon Fleisher, and is now a Steinway artist. He is one of the most dynamic and accomplished musicians performing before the public today. He is consistently acclaimed for his recitals, recordings, and appearances with orchestras throughout the world. His concerts attract a wide range of audiences, as he has eagerly embraced traditional piano literature as well as an eclectic range of repertoire, including new music commissioned especially for him, world music, and his own transcriptions. Mr. Fan's engaging personality, technical assurance, lyricism, and sheer musicality win over audiences wherever he performs. As a recording artist, Mr. Fan scored two consecutive Billboard Top 10 Debuts with his solo CDs, World Keys and West of the Sun." Well, so much for my not recognizing his name. First up on the program is the Fantaisie-Ballet by French composer, conductor, and organist Gabriel Pierne (1863-1937). This work came early in Pierne's career, when he was only twenty-one, and Fan and company well demonstrate its youthful vigor and Romantic flair. The soloist captures its light, elegant moments nicely and then fills it out with a grand and exciting virtuosity. Next is Vals Capricho by Mexican concert pianist and composer Ricardo Castro Herrera (1864-1907). The "Caprice Waltz" is another virtuosic piece, and Fan again demonstrates his dexterity in playing with seemingly ten fingers on each hand. Yet it is also a surprisingly delicate piece of music, with a wonderfully lilting rhythm that Fan and the Sinfonietta express as perfectly as one could imagine. After that is Krakowiak in F Major by Polish composer and virtuoso pianist Frederic Chopin (1810-1849). This "Grand Concerto Rondo" Chopin based on the style of a familiar dance in the Krakow area, and Fan and company handle it with a charming grace and refinement, with just a touch of twinkle. The fourth item is Valse-Caprice in A-flat Major "Wedding Cake" by French composer, organist, conductor, and pianist Camille Saint-Saens (1835-1921). The work is quite popular so you'll find a lot of pianists have recorded it, but Fan does it up as well as anybody, smoothly articulate and cheerfully pulsating. The fifth selection is Polonaise Brillante, a solo piano piece by German composer, conductor, pianist, and critic Carl Maria von Weber (1786-1826) and later orchestrated by Franz Liszt. Typical of Liszt, the piece is full of bravura showmanship and heroic landscapes, which Fan executes with an unerring command. The penultimate number is the Grand Tarantelle by American composer and pianist Louis Moreau Gottschalk (1829-1869), reconstructed by Hershy Kay. Critics often credit Gottschalk as a precursor of ragtime, itself a precursor of jazz. This work, however, is energetically rhythmic in the manner of an Italian tarantella. It's dance tune swirls and whirls, with Fan hardly stopping to catch his breath. It's quite a lot of fun. Finally, we get Dark Dancers of the Mardi Gras, a "Fantasy for Orchestra with Piano," by American composer Charles Wakefield Cadman (1881-1946). His music is probably the most unique on the album, partly Romantic, partly modern, partly Joplin, partly Gershwin, and mostly descriptive, it is melodious, ambitious, and vivid. Fan, Chagnard, and the Northwest players appear to be having a great time with it, and the piece ends the program on a splendidly grand, celebratory note. Producers Marina A. Ledin, Victor Ledin, and Marcia Gordon Martin and engineer Keith O. Johnson made the recording at Lagerquist Concert Hall, Pacific Lutheran University, Tacoma, Washington in August 2013. As always with an album engineered by "Professor" Johnson, we get above all a realistic presentation. We don't always get the most transparent recording in terms of ultimate or absolute clarity, but we do get a lifelike ambiance, a truthful sense of orchestral depth and dimensionality, a pleasant hall resonance, a quick transient response, a broad frequency range (lows through the floor, highs shimmering endlessly), wide dynamics, strong impact, and plenty of air and space around the instruments. The piano itself appears well placed in regard to the orchestra, neither too far out front nor too hidden away but part and parcel of the overall sonic picture. The recording sounds most natural all the way around. Distinguished Concerts International proudly presents I Believe…Remembering the Holocaust, commemorating the 76th Anniversary of Kristallnacht, featuring the American premiere of the oratorio I Believe by Zane Zallis. Distinguished Concerts International New York presents a special program dedicated to the remembrance of the Holocaust on Sunday, November 9 at 8:00pm at Alice Tully Hall, Lincoln Center. Taking place over Veteran's Day weekend, November 9 also marks the 76th anniversary of Kristallnacht – "The Night of Broken Glass" – the infamous night in 1938 when Jewish institutions and business throughout Nazi Germany and Austria were destroyed, and shards of broken glass littered the streets. The concert features the American premiere of I Believe by Zane Zallis, a large-scale oratorio for choir, children's choir, orchestra, and narrator, and acclaimed Broadway singers Sara Jean Ford, Alex Gemignani and Drew Gehling with conductor Jonathan Griffith. Zalis uses a powerful contemporary musical language to capture the essence of a story of hate, despair, and hope, with words drawn directly from stories of Holocaust survivors. The evening will also feature the New York premiere of In the Shadow of the Holocaust by Donald McCullough, who also conducts. A portion of all ticket sales will go directly to the Holocaust Resource Center of Temple Judea, Manhasset, New York. Tickets: www.lincolncenter.org or 212.721.6500 or at the Alice Tully Hall box office (65th Street between Broadway & Amsterdam). The production makes its west coast premiere at Cal Performances November 14 and 15 in Zellerbach Hall, Berkeley, CA. British tenor Ian Bostridge returns to Cal Performances for the first time since 2011, in the West Coast premiere of a new multimedia staging of Benjamin Britten's haunting opera, Curlew River – A Parable for Church Performance, Friday, November 14 at 8:00 p.m. and Saturday, November 15 at 2:00 p.m. in Zellerbach Hall, Berkeley, CA. Bostridge, a noted interpreter of Britten's work, sings with "plangent poignancy and haunted intensity" (The Telegraph, UK) as the grief-stricken Madwoman in an immersive production, directed and designed by visual artist Netia Jones. Watch her in an exclusive video interview with Cal Performances. Part noh theater and part medieval mystery play, Britten's austere, ritualistic opera from 1964 is an encounter between Japanese aesthetics and Christian traditions, with music that incorporates plainchant, chamber organ, and rhythms inspired by traditional gagaku drumming, A rarely-performed work, Curlew River is based on the play Sumidagawa by Jürö Motomasa, which tells the story of a Madwoman (Bostridge) tortured by the loss of her child, joined by a trio of male characters (the Abbot, Ferryman, and the Traveller) with a chorus of eight pilgrims and a score for seven musicians, which are performed live by UK chamber ensemble Britten Sinfonia and the Britten Sinfonia Voices. Curlew River is co-produced by Cal Performances in collaboration with the Barbican Centre, London; Lincoln Center for the Performing Arts, New York; and Carolina Performing Arts. Residency activities are planned on campus and in the community, including an artist talk with director and video designer Netia Jones moderated by Cal Performances' Associate Director Rob Bailis, on Friday, November 14 at 6:00 p.m. in Zellerbach Hall. This talk is free and open to the public. Tickets for Friday, November 14 at 8:00 p.m. and Saturday, November 15 at 2:00 p.m. in Zellerbach Hall range from $30.00 to $90.00 and are subject to change. Tickets are available through the Ticket Office at Zellerbach Hall, at (510) 642-9988, or at www.calperformances.org and at the door. Jennifer Koh, recognized for her intense, commanding performances, performs a new arrangement of Anna Clyne's Rest These Hands and Bach's Violin Concerto No. 1 in A minor, BWV 1041, with Orpheus Chamber Orchestra in a concert presented by Stanford Live at Bing Concert Hall on Sunday, November 2 at 7:00 p.m. The conductorless ensemble, which emphasizes artistic collaboration, democratic process, and rotating leadership, also performs Grieg's Holberg Suite, Op. 40, and Mozart's Symphony No. 34 in C Major, K. 338. Orpheus performs this same program featuring Ms. Koh, who makes her Orpheus debut this season, on tour at California Polytechnic State University on November 1, Purchase College on November 30, and Carnegie Hall on December 6. The concerts presented by Cal Poly Arts and Stanford Live mark Orpheus' first return to perform in California since 2007. The newly orchestrated Rest These Hands, originally composed for recorded layers of solo violin, is one of three new works that Orpheus Chamber Orchestra has commissioned this season as part of American Notes, its new commissioning initiative of works from composers who represent varied perspectives on American music. In addition to the London-born, Chicago-based composer Anna Clyne, Orpheus has commissioned works to be premiered this season from Brooklyn-based composer-pianist Timo Andres and Turkish composer-pianist Fazil Say. "Our American Notes initiative this season uses these three composers' perspectives on America and American music as it reflects back to them," says Orpheus Executive Director Krishna Thiagarajan. "It relates to Orpheus' position as US ambassador while on tour abroad, and as a representative of international perspectives while performing within the States." Mr. Thiagarajan says of working with Ms. Koh, "She clearly thinks about music the same way we do: being collaborative, pushing the envelope, and marrying the old composers with young emerging composers." Tickets, starting at $50, are available online at live.stanford.edu, by phone at (650) 724-BING, or in person at the Bing Concert Hall Ticket Office at 327 Laursen St, Stanford, CA 94305. Germany's second oldest city orchestra looks back on a 150-year history that includes legendary music directors Felix Mendelssohn-Bartholdy and Robert Schumann, who helped shape its artistic identity. Duesseldorf's Tonhalle (Sound Hall) is the orchestra's home and is presenting a year of musical highlights, with an entire week of events around the orchestra's birthday on October 29, 2014. The Düsseldorf Symphonic Orchestra held its first public concert on October 27, 1865 – making it one of Germany's oldest city orchestras. A spectacular anniversary concert is how the orchestra will celebrate its 150 year history. The concert, titled "Wir feiern!" (We celebrate! ), will reunite the orchestra with three of its former managing music directors: John Fiore, Bernhard Klee and Salvador Mas Conde. They, along with composers Felix Mendelssohn-Bartholdy and Robert Schumann, are responsible for the orchestra's international renown. The anniversary concert includes pieces by Strauss, Ravel, and Grieg. The entire week will be filled with high-caliber performances, including: Chamber Music with Isabelle van Keulen on October 23; the "Sternzeichen" (Zodiac Signs) on October 24, 26, and 27; and a charity concert benefitting non-profit "action medeor" on October 30, hosted by German TV personality Anke Engelke, will conclude the anniversary week. All performances will take place at Düsseldorf's Tonhalle – the orchestra's home and one of Germany's most interesting and beautiful performance venues. Located right on the Rhine River by the popular Rhine River Promenade, Tonhalle's dome-shaped roof can be seen from far away. The building used to be one of the world's biggest planetariums, and today houses the stars of the music universe with about 400 performances each year, especially classical, jazz and soul, and even comedy and cabaret. Its round shape is an unusual set up for audience and orchestra, and the building's transformation from planetarium to concert hall is considered a masterpiece in both architecture and acoustics. For more information, please visit www.tonhalle.de. This November, the Latvian dramatic soprano reprises the role that helped her make history with back-to-back Metropolitan Opera role debuts. In April of this year, soprano Kristïne Opolais made headlines when, following a sensational Met Opera role debut as Cio Cio San in Madama Butterfly on a Friday evening, she agreed to step in at the last minute as Mimì in the next afternoon's production of La Bohème. 48 hours and two on-stage deaths later, opera lovers and critics the world over had become enchanted with Ms. Opolais and her "voluptuous, expressive voice" (The New York Times). Now, she returns to the Met Opera for Franco Zeffirelli's beloved production of La Bohème, this time as a member of the main cast. She is scheduled to sing at the 11/14, 11/20, 11/24, 11/28, 12/1 and 12/5 performances in 2014, with additional appearances planned for early 2015. Chautauqua Institution is pleased to announce the selection of Rossen Milanov as the ninth music director of the Chautauqua Symphony Orchestra. As music director, Milanov will serve as the principal conductor and artistic director of the CSO and as an advocate for the orchestra and the classical arts within and beyond the Chautauqua community. The 49-year-old Bulgarian-born conductor will begin his responsibilities immediately in preparation for his inaugural summer of residency in 2015. His public debut will take place at the CSO's season-opening performance on Thursday, July 2, 2015, and he will conduct 10 concerts in the 2015, 2016 and 2017 seasons. "I am very excited and honored to be collaborating with the musicians of the Chautauqua Symphony Orchestra, to catalyze the artistic growth, introduce new ideas, diversify the programming and connect with all of the Chautauqua community in a meaningful and inspiring way!" Milanov said. In September, Milanov was selected as the Columbus Symphony Orchestra's next music director, beginning with the 2015–16 season. He is currently music director of the Princeton Symphony Orchestra, music director of the professional training orchestra Symphony in C in Camden, New Jersey, and principal conductor of the Orquesta Sinfónica del Principado de Asturias in Spain. 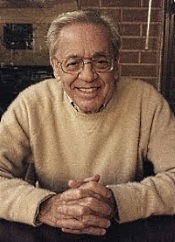 Milanov previously served as associate conductor of the Philadelphia Orchestra. At Chautauqua, he joins a team of exceptional artistic directors who are each dedicated to tradition and innovation in the areas of orchestra, opera, theater, dance and visual arts. "I am very pleased to welcome Rossen Milanov to the Chautauqua community, an environment in which his remarkable skills and artistic sensibilities will flourish," said Thomas M. Becker, president of Chautauqua Institution. "In collaboration with the CSO, Maestro Milanov will engage Chautauqua audiences of all ages in an enriching relationship with great music and the artistry of gifted musicians." Milanov's appointment is the culmination of a search and selection process led by Marty W. Merkley, Chautauqua Institution vice president and director of programming, and Deborah Sunya Moore, associate director of programming. Fine Arts Performances Shine in Fathom Events' Fall/Winter Season Filled with Classical Ballet, Opera and Live Theater. Live Performances by London's Royal Ballet Theatre, Moscow's Bolshoi Ballet, New York's Metropolitan Opera, and Landmark Shows from London's West End to Be Showcased in Cinemas Nationwide. Whether people live in major cultural capitals or in smaller markets, where the leading touring arts companies rarely if ever stop, there's a large and passionate audience for the best of classical music, dance and event theater. So leave it to Fathom Events, the recognized leader in bringing the best and most diverse lineup of alternative programming to cinemas across the U.S., to give culture vultures everywhere a healthy dose of ballet, opera and live theater during the cold fall and winter months, from now right through the first few months of 2015; audiences will welcome in the spring with a robust lineup of classic ballets. For aficionados of opera, there is a full slate of live performances from The Metropolitan Opera that run through April; for fans of classical dance two of the world's most renowned companies – Moscow's Bolshoi Ballet and London's Royal Ballet – will present a series of programs, nearly all of them recorded live earlier that day (in Moscow and London, respectively), running into May of 2015; for live theater goers, "NT Live: Of Mice and Men" and an encore showing "NT Live: Frankenstein" give fans a chance to experience major stars on stage, while "Billy Elliott The Musical Live" offers the unique opportunity to experience the hit stage musical in a special presentation featuring more than 25 of the young actors who've played the title character on stage. Rounding out Fathom Events' cultural offerings for the next few months is a spectacular exhibitions that captured the imagination of the world: an encore showing of the hugely popular "Pompeii From the British Museum," but that one is coming up shortly! Young virtuoso pianist Joyce Yang opens the 2014-15 Virginia G. Piper Concert Series, Sunday, November 16, 2014, 7:30 p.m., Scottsdale Center for the Performing Arts, Scottsdale, Arizona. Scottsdale Center for the Performing Arts will present a recital by internationally acclaimed pianist Joyce Yang as part of the Virginia G. Piper Concert Series on Sunday, Nov. 16, at 7:30 p.m. She will perform a selection of works by Isaac Albeniz, Claude Debussy, Alberto Ginastera and Sergei Rachmaninoff. Known for her virtuosity, lyricism and magnetic stage presence, Joyce Yang has established herself as one of the leading artists of her generation, showcasing her colorful musical personality in solo recitals and collaborations with the world's top orchestras and chamber musicians. Yang came to worldwide attention in 2005 as the youngest contestant at the Van Cliburn International Piano Competition, winning the silver medal and sweeping additional awards for "Best Performance of Chamber Music" and "Best Performance of a New Work." 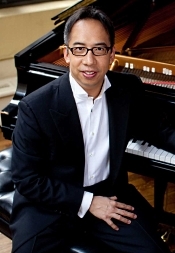 "I have known Joyce Yang for many years and had the privilege of presenting her San Diego debut when she was just 12 years old, and later, watching the extraordinary performance she gave at the Cliburn Competition, where she won the silver medal at the age of 19," remarked Neale Perl, president and CEO of the Scottsdale Cultural Council. "Joyce is one of the shining stars of the new generation of great pianists and musicians." 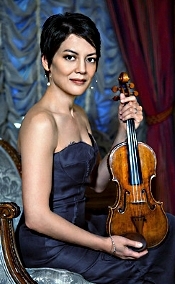 Yang has performed as soloist with the New York Philharmonic, Chicago Symphony, Los Angeles Philharmonic, Philadelphia Orchestra, Deutsches Symphonie-Orchester Berlin and the BBC Philharmonic, among many others. In recital, she has taken the stage at New York's Lincoln Center and Metropolitan Museum of Art; the Kennedy Center in Washington, D.C.; Chicago's Symphony Hall; and Zurich's Tonhalle. 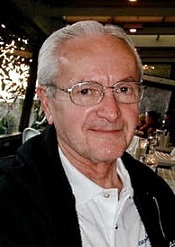 Chamber choir Cor Cantiamo, conducted by Eric A. Johnson, will perform the world premiere of Swiss-French composer Richard Dubugnon's "Psalm 10" in a choral concert at 7:30 p.m. on Friday, November 7, at Saints Peter & Paul Catholic Church, 36 N. Ellsworth St., Naperville, Ill. Completed earlier this year, Dubugnon's "Psalm 10" for unaccompanied, mixed-voice choir and soprano soloist was commissioned by nonprofit, classical sacred music foundation Soli Deo Gloria, Inc., of Glen Ellyn, for its Psalms Project, a collection of contemporary choral works based on the Book of Psalms. "Psalm 10" opens with "Why, Lord, do You stand far off? Why do You hide yourself in times of trouble?" 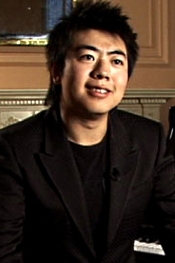 Dubugnon graduated from the Paris Conservatory and London's Royal Academy of Music. His music has been performed by the Orchestre de Paris and the Berlin and New York Philharmonic orchestras. The November 7 program, titled "Inspirited," will launch the church's 2014–15 Concerts at Saints Peter & Paul series. The concert "will explore composers' efforts to understand the divine and create beauty in the world," according to the church's website. Two other Soli Deo Gloria-commissioned Psalm settings will be heard on the mostly contemporary music program: Gavin Bryars' "Psalm 141" ("I cry unto thee: make haste unto me!") and Daniel Kellogg's "Preserve Me, O God" (Psalm 16). The concert will open with Timothy C. Takach's "A Worshipper and a Man," Abbie Betinis's "Carmina Mei Cordis" (Songs of My Heart), and Matthew Mariano's "Doxologia." Next, Cor Cantiamo will sing the Bryars and Kellogg Psalms, paired with English Renaissance composer Thomas Weelkes' "When David Heard." Following the premiere of Dubugnon's "Psalm 10" with soloist JoEllyn Caulfield, the choir will offer six songs based on poems by Rainer Maria Rilke, William Blake, William Shakespeare, and Finland's Jaako Mäntyjärvi and with music composed by Paul Hindemith, John Tavener, and Mäntyjärvi. Concertgoers will also hear three songs on the theme of flight in the natural world: Johannes Brahms' "Der Falke" (The Falcon), Op.93a, No. 5; Charles Stanford's "The Blue Bird"; and Mia Makaroff's "The Butterfly." Stacy V. Gibbs' arrangement of "I Don' Feel No Ways Tired," a traditional spiritual, concludes the program. Concert tickets are $15 general admission, $8 for students, and $45 for premiere seating in the front rows and a post-concert reception with the artists. For tickets and information, call Saints Peter & Paul Catholic Church at (630) 718-2206. Web site is www.sspeterandpaul.net. Tickets may also be purchased at the door. Jonas Kaufmann, tenor; Julia Kleiter, soprano; Jochen Rieder, Berlin Radio Symphony Orchestra. Sony Classical 88843087712. This disc is for fans of international superstar Jonas Kaufmann, fans of early twentieth-century stage and screen songs, and maybe fans of Romantic nostalgia as well. 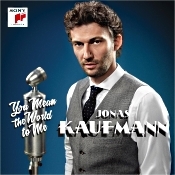 German operatic singer Jonas Kaufmann says that the idea for the album You Mean the World to Me came to him at the end of a concert when he had finished singing a light number for a crowd of 20,000 delighted admirers. He thought, "Why should songs such as "You Are My Heart's Delight" and "You Mean the World to Me" be no more than encores? Why not make them and other perennial favourites the main programme?" Accordingly, we have an album that includes seventeen light songs by German, Austrian, Hungarian, Russian, and Bohemian composers, the songs presented in their original arrangements and written between 1925-1935 for the Berlin stage and screen. The tunes cover a turbulent era that included postwar economic strife, the establishment of the Weimar Republic, the close of the Roaring Twenties, the worldwide Great Depression, and the rise of Naziism. Yet through it all, people wrote and sang and listened to music: popular, folk, jazz, and classical. 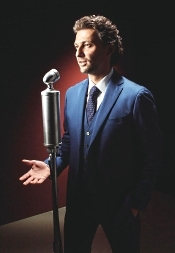 On the present album, Kaufmann sings for us some of his favorite popular songs of the period. Now, here's the thing: You have to remember that Mr. Kaufmann is primarily an opera singer, and when opera singers turn to more-popular fare, the results sometimes sound a bit like overkill. Such is the case here, with Kaufmann's huge tenor voice occasionally overpowering the simplicity of the stage and film numbers presented. He takes it all very seriously, of course, but by making most of the selections sound like pieces from Wagnerian opera, he perhaps loses a little something in the way of stage-musical color and drama. That is, he never quite convinced this listener that he was a character in a musical play or a part of an actual story line. Instead, he offers the songs out of context in big, full-throated fashion, some in German, some in English, the ones in German coming off best. Nonetheless, there is little doubt he loves the material, and his vocal presence conveys solid authority and conviction. He will not disappoint his fans. The songs are too numerous to cover, so I'll just mention the names of the composers and point out a few selections I enjoyed most. The composers include some familiar names and a few less familiar: Lehar, Tauber, Stolz, Kalman, Heymann, Abraham, Benatzky, May, Spoliansky, Kunneke, and Korngold. My favorite selections include everything by Franz Lehar, whose operettas have always delighted me. Here, you'll find "Girls Were Made to Love and Kiss," "You Are My Heart's Delight," "My Little Nest of Heavenly Blue," all sung in English; and "Freunde, Das Leben Ist Lebenswert" and "Je T'ai Donne mon coeur." Lehar was probably the most popular operetta composer of his or any other day, and Kaufmann does his music fair justice. Years ago the singer Richard Tauber was instrumental in Lehar's prosperity, helping to make Lehar's songs so wildly successful. In fact, Marlene Dietrich once remarked that she understood why Bing Crosby was such a big star: "He's learnt everything from Tauber." Anyway, I bring it up because Kaufmann has a big order to fill the vocal shoes of Tauber (and to a lesser extent Crosby). Having only heard Tauber on a very few occasions, I can say that Kaufmann surpasses him handily in vocal command; however, Tauber had a more delicate way of phrasing lines, something that tends slightly to escape Kaufmann, who is more of an operatic technician than a Twenties' crooner. Kaufmann seems most at home in the music of Robert Stolz ("Im Traum Hast du Mir Alles Erlaubt," "Don't Ask Me Why"). Stolz wrote primarily for films, and his material seems fairly accessible today, with Kaufmann appearing to put even more heart in it than he does some of the other selections. Likewise with Emmerich Kalman and Werner Richard Heymann. The songs trip lightly off Kaufmann's tongue. On three numbers soprano Julia Kleiter joins Kaufmann, and she provides a charming counterbalance to the tenor's big, robust voice. In all, it's a delightful album, and while I may have some minor reservations, it offers a ton of musical pleasures. Producer Philipp Nedel, balance engineer Philip Siney, and recording engineers Martin Kistner and Hansjorg Seiler made the album at the Broadcasting Center, Nalepastrasse, Berlin in January 2014. Kaufmann's voice sounds well recorded, although it's a little closer to us than the orchestra. In the media pictures of him, he's singing directly into a microphone, and that's how his voice comes off in the recording, somewhat bigger than life compared to the orchestral accompaniment. Still, there is little glare or edge in the voice, and it appears quite natural. The orchestra plays lightly and sweetly behind him, never intrusive, always supportive, and sounding nicely detailed at the same time. It clearly knows its place. Also, Night on the Bare Mountain (original and Rimsky-Korsakov versions) and several shorter works. 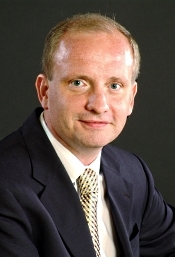 Theodore Kuchar, National Symphony Orchestra of Ukraine. Naxos 8.555924. This is another one of those modestly priced Naxos releases that helps define the word "bargain." To begin with, it will delight hi-fi buffs because the sound is exceptionally clean. Not only are the dynamics strong and the frequency response wide, there is virtually no bass hangover to cloud the midrange. This can be a blessing and a curse, naturally, depending on your standpoint. The transparency of the sound is superb, but without the bass resonance, there isn't a lot of concert hall feel to the music. 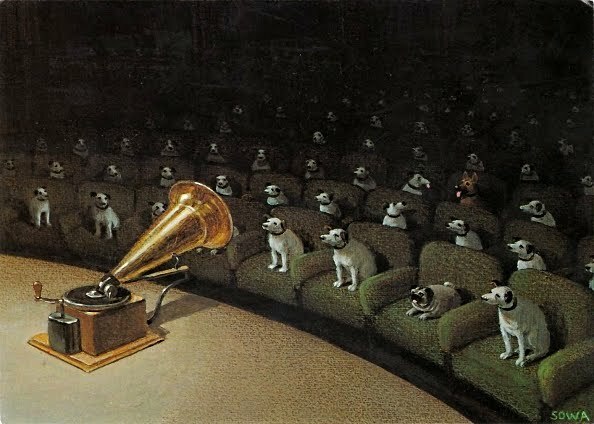 An audiophile friend of mine once told me he didn't like attending live orchestral events because the sound of real music was too muddy for him; it sounded better in his home. He'd like this disc. I, on the other hand, prefer the added warmth of a little bass overhang and hall reverberation. Personal taste. Nevertheless, there's no denying Maestro Kuchar's disc sounds great and, more important, its musical content will satisfy a lot of people because there's something here for everyone. The first two items are Night on the Bare Mountain, performed first as originally composed by Modest Mussorgsky and then as later reorchestrated by Nikolai Rimsky-Korsakov. Although most of us have multiple copies of the familiar Rimsky-Korsakov version, the original is harder to find, the best one still being with David Lloyd-Jones and the London Philharmonic on an old Philips album. But to have both versions on one disc along with the Pictures at an Exhibition is somewhat unique. This was the first time I'd ever actually listened to the two versions of Bare Mountain side by side, and it amazed me how different they are and how much I had underappreciated the composer's original version. 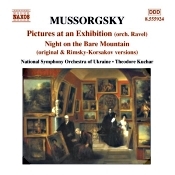 Mussorgsky's view is much the coarser, more awkward, of course, but considering the content of the tone poem--a Witches' Sabbath, after all--it works pretty well. In addition to Bare Mountain and Pictures, the disc contains two short pieces, the "Hopak" from Sorochintsy Fair and "Golitsin's Exile" from Khovanchchina, both of them done up by Kuchar in fine, vivid, vivacious style. The Pictures at an Exhibition, as you know, is a series of musical paintings, and Maestro Kuchar does well with them, each episode except the last being quite well characterized. I thought the "Great Gate of Kiev" a trifle underpowered, but the interpretation may have suffered from what was for it an unfortunate comparison: Just about the time I first listened this 2003 Naxos disc, I had just listened to Fritz Reiner's celebrated RCA Living Stereo account with the Chicago Symphony on what was then a newly remastered (and very costly) JVC XRCD compact disc. The old Reiner recording is a marvel of technical accomplishment and musical know-how that clearly upstaged the new entry in every way, albeit at almost five times the cost on JVC and with no fillers. Nevertheless, Kuchar's account, especially in the early going, holds its own against almost any competition and should please practically anyone who doesn't already have a favorite Pictures. For the money, one can hardly go wrong. Violin Concertos Nos. 1 and 2; Air; Gavotte en Rondeau. 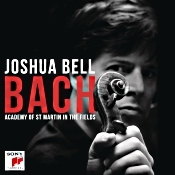 Joshua Bell, violin; Academy of St. Martin in the Fields. Sony Classical 88843 08779 2. I said recently that I'm always a little suspicious of albums that feature the name of the star soloist over that of the composer he or she is playing. There seems to me a good deal of hype from the recording company and more than a touch of egotism on the part of the star involved. Fortunately, when the star is as far beyond reproach as Joshua Bell, it probably doesn't matter. In this case, all we get on the album's cover are the words "Joshua Bell: Bach." It's as if it doesn't even matter what he's playing; so long as we know who's involved, that should be all that counts. I admit I'm still a little put off by it, but I can't deny the results are decidedly agreeable. So, the first things on the program are Bach's two Violin Concertos, No. 1 in A Minor, BWV 1041 and No. 2 in E Major, BWV 1042. Bell, as soloist and leader of the orchestra, takes both of them at a modest clip. There is no rushing about here to outpace the historically informed crowd. Nor is the reading too slow or sluggish. Instead, Bell takes a middle ground, providing a stylishly elegant interpretation that does the music proud. The question, I suppose, is whether these performances are significantly better or at least different from a dozen other recommendable performances to warrant the disc or download purchase. Certainly, one can say that Bell is a commanding performer, his Bach concertos projected with authority. The articulation one hears in every note by the soloist and the orchestra is a cause for joy. So, yes, one senses a strong presence involved, and there's surely nothing wrong with that. Still, I'm not sure he erases memories of old favorites like Menuhin, Grumiaux, Kuijken, Meyers, Hahn, Zehetmair, St. John, and others. But that isn't the point, I'm sure. Mr. Bell is a modern star, and he will not disappoint his fans or Bach fans with his performances. And it goes without saying that the Academy of St. Martin in the Fields, seemingly pared down a bit for the occasion, perform with their usual impeccable finesse. While I enjoyed Bell's control in the concertos, I liked the accompanying short pieces even more. First, there's the Chaconne, played in Mendelssohn's violin-and-piano arrangement with a further orchestral augmentation made by Julian Milone. Bell calls it an "arrangement of an arrangement" or a "homage to a homage." Whatever, it's delicious, subtle and refined, the orchestra never an intrusion on the detailed intricacy of the work, Mr. Bell's virtuosic musicianship always at the service of the music. Following the Chaconne is the famous Air from Bach's Orchestral Suite in D Major, and ending the show is the Gavotte en Rondeau from the E Major Partita in an arrangement inspired by Robert Schumann's piano accompaniment. Bell handles these closing numbers with an exquisite sensitivity, making them a delight. As I say, there is not much one can complain about here. The performances are first rate and the sound is fine. However, there is one minor personal annoyance I should mention that I'm sure most other folks wouldn't even notice. Now, understand, I realize that Mr. Bell is a superstar musician and all, and I recognize that he, his publicist, the orchestra, and the record company want to capitalize on his popularity. But I wonder if it's really necessary to have full-page pictures of the man on the booklet cover, the booklet back, the inside of the disc case, the back of the disc case, and two more within the notes? Plus several more pictures of what I take to be his hands. I mean, aren't six full-page pictures something like overkill in so small a product? Well, OK, picky, I know. Adam Abeshouse produced, recorded, mixed, and mastered the album, so if you don't like the sound, you know who to blame. He made it at Air Studio, London in April 2014. The sound is a trifle close, but at the same time it's extremely clear and well delineated. The violin appears well incorporated with the orchestra, not too far out in front or too recessed. What's more, the instrument has a realistic resonance around it, making the strings easy on the ear. There isn't a lot of dimensionality or depth to the orchestra, though; it appears pretty much in the same plane as the violin. As to dynamic range, it is quite wide, probably more so than you would expect from a recording of Bach. In any case, it's all pleasant enough and should please most listeners. Percussion music of Kraft, Naidoo, Griswold, Pereira, Schankler, and Deyoe. Los Angeles Percussion Quartet. Sono Luminus DSL-92180 (2-disc set, CD & BD). 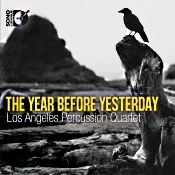 A couple of years before the present album, the Los Angeles Percussion Quartet had a popular and critically acclaimed release with their multi-Grammy nominated Rupa-Khandha. This newer album from 2014, The Year Before Yesterday, is a sort of sequel to that success; and because a big part of both albums' success is the high quality of the sound, Sono Luminus is again issuing it in a two-disc set that includes both a standard compact disc and a high-definition Blu-ray disc. The performances include a wide variety of percussion instruments, with the LAPQ playing them with consummate skill. 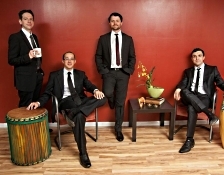 The members of the LAPQ are Justin Dehart, performer and teacher at Chapman University Conservatory of Music; Matt Cook, drummer and percussionist; Cory Hills, performer and composer of over seventy-five compositions for percussion; and Nicholas Terry, a percussionist specializing in contemporary classical music. All of them are highly skilled artists well versed in the ways of modern percussion performance. The album opens with a three-movement piece called Fore! by one of America's best-known composers of percussion music, William Kraft (b. 1923). Much of music utilizes marimba, chimes, vibraphone, and drums and provides a wealth of expression. Like most modern music, it seems more about descriptive phrasing than actual melody, but the rhythms are so infectious, the playing so good, and the recording so lifelike, it will have most listeners entranced for its duration. While I found most of the album fascinating, this item was my favorite selection on the program. Next comes the title tune, The Year Before Yesterday, by South African composer Shaun Naidoo. Of interest, Mr. Naidoo holds a Doctor of Musical Arts degree in Composition from the University of Southern California, a Masters degree in Composition from USC, and a Bachelor of Music degree in Music Theory and Piano Performance from Rhodes University in South Africa. One can see why the quartet chose this number as the title song. It is, indeed, a "song," a sweet and melodious tune punctuated by a series of finely etched impressions from the LAPQ. After the title tune comes Give Us This Day, a five-movement work by Erik Griswold, whose Web site describes him as an "eclectic composer-pianist" who "fuses experimental, jazz and world music traditions to create works of striking originality." It combines orchestral percussion, "found objects," and toy instruments to produce a work that is both rhythmically driving, moody, and meditative by turns. The LAPQ give it an added vitality through their always precise yet vigorous playing. I especially loved the sound of its central movement, "Cold Steel." I saw maybe one of "The Expendables" in the title, Arnold or Sly. Concluding the program are three short pieces: Mallet Quartet by composer and percussionist Joseph Pereira, Principal Timpanist of the Los Angeles Philharmonic; Blindness by composer, pianist, accordionist, and electronic musician Isaac Schankler; and Lullaby 5 by composer, conductor, and guitarist Nicholas Deyoe. Two vibraphones and two marimbas do combat in the Mallet Quartet, a remarkable set of rhythmic vibrations. The LAPQ make the four instruments do and sound like almost anything they choose. Amazing variety. Blindness is probably the quietest and most-sensitive piece on the program and Lullaby 5 the most ambitious despite its seemingly tranquil intertwining of instruments. Producer Dan Merceruio and engineer Daniel Shores made the album in 24bit, 192kHz Surround Sound at Oliphant Hall, Chapman University, Orange, California in January 2014. Sono Luminus released the recording in this two-disc set on a standard CD in two-channel stereo and on a Blu-ray disc in high-definition multichannel (5.1 DTS HD MA 24/192kHz, 7.1 DTS HD MA 24/96kHz, and 2.0 LPCM 24/192kHz). Since I have my Blu-ray player connected to my home-theater system in another room from my music system and since my music system has the superior speakers, I listened primarily to the standard CD in the music room. Afterwards, I listened to the Blu-ray disc in 5.1, 7.1, and 2.0 through my 7.1 home-theater system. Sonic comparisons between the two systems are unfair because, as I say, my two music-room speakers are far better than the seven speakers and subwoofer in the theater room. So, be aware that I took my impressions of the music's sound mainly from the two-channel CD. Fortunately, that was probably enough, and one can only imagine that the Blu-ray sound over the same quality system would be even better. The sound from the CD alone appears state-of-the-art. The all-important transient response is very quick, combined with a wide dynamic range and strong impact. The instruments stand out clearly and sharply, as though they were in the room with you. What's more, even though the recording seems a mite close-up, there is still plenty of space and air around the instruments and a relatively long decay time on the notes so you get a realistic presence in the music. From the Blu-ray disc one gets the additional ambience of the surround channels and presumably greater definition from the higher bit rates involved. Renowned German countertenor Andreas Scholl makes his sole Bay Area appearance of the 2014-15 season in a series of concerts with Philharmonia Baroque Orchestra led by guest conductor Julian Wachner. Four performances take place around the Bay Area at Bing Concert Hall (Wed, Nov 5), Calvary Presbyterian Church in San Francisco (Fri, Nov 7), and First Congregational Church in Berkeley (Sat and Sun, Nov 8-9). Tickets are available through City Box Office and Stanford Live and start at just $25. "I'm thrilled that my friend Andreas Scholl, who has worked with the Orchestra before, will be back to sing a Bach cantata and Handel arias," remarked music director Nicholas McGegan. Scholl, who last appeared with Philharmonia over a decade ago in the St. John Passion, will sing Bach's moving Cantata No. 170, "Vergnügte Ruh, beliebte Seelenlust," as well as Handel selections including "Va tacito" from Giulio Cesare and "Dove sei" from Rodelinda. Writing of a 2010 recording, BBC Music Magazine noted that "few can equal the sheer beauty of tone" which Scholl displays. Julian Wachner, who appears at the San Francisco Opera in October to conduct Handel's Partenope, is director of music and arts at Trinity Wall Street in New York City and music director of the Washington Chorus. He leads the Orchestra in a program of instrumental works featuring the natural horn, including Bach's beloved Brandenburg Concerto No. 1, Telemann's Concerto in F major for violin, oboe, and two horns, and the Sinfonia to Bach's Cantata No. 42. Hailed from The New Yorker to the Los Angeles Times for his dynamism and joyous originality, Wachner is a specialist in Baroque interpretation. He is leader of the Baroque Orchestra & Choir at Trinity Wall Street, recently nominated for a Grammy for its recording of Handel's Israel in Egypt. New York City's breathtaking, majestic Church of St. Ignatius Loyola once again comes to life with Sacred Music in a Sacred Space's N.P. Mander Organ Recital Series. The second recital on the 2014-15 series features acclaimed organist David Enlow on Sunday, November 2 at 3:00 pm. Last month, Organ Canada wrote that Enlow "understands the music he performs, respects its narrative but manages to delve further into the score with his incredible sense of expressiveness and sense of musical form." With this unique program, David Enlow conjures up the myriad colors and textures of orchestral music, all on one powerful instrument. Works included on the program include several of Enlow's own transcriptions, including the world premiere of his arrangement of Dvorak's Slavonic Dances, Op. 46 (movements I, II and VI). The N.P. Mander organ adds another layer of drama to the overtures of Strauss's Die Fledermaus and Verdi's La Forza del Destino, also transcribed by Enlow. Rounding out the program are Franck's Grand Pièce Symphonique and Enlow's transcription of Debussy's Petite Suite. The N.P. Mander organ—at 5,000 pipes, 30 tons, and 45 feet high—is the largest tracker-action pipe organ in the New York metropolitan area. This massive, kingly instrument bellows beneath the massive vaults at St. Ignatius Loyola. To witness David Enlow acting as one-man orchestra and taking the organ to its limits will be a treat to any audience member. Prokofiev, Rachmaninov, Müller, and Enescu are also on the program in Evanston, Ilinois (Nov. 23), Geneva (Nov. 30), Chicago (Dec. 3). The Orion Ensemble, winner of the prestigious Chamber Music America/ASCAP Award for Adventurous Programming, continues its 22nd season "A Taste of Chicago, A World of Romance" with "Rhapsody," a program showcasing Chicago composer Sebastian Huydts. Performances take place at the Music Institute of Chicago's Nichols Concert Hall in Evanston November 23; First Baptist Church of Geneva November 30; and Sherwood, The Community Music School of Columbia College Chicago December 3. The Orion Ensemble's concert program "Rhapsody" takes place Sunday, November 23 at 7:30 p.m. at Music Institute of Chicago's Nichols Concert Hall, 1490 Chicago Avenue in Evanston, Il; Sunday, November 30 at 7 p.m. at First Baptist Church of Geneva, 2300 South Street in Geneva, Il; and Wednesday, December 3 at 7:30 p.m. in the Recital Hall at Sherwood, The Community Music School of Columbia College Chicago, 1312 S. Michigan Avenue in Chicago. Single tickets are $26, $23 for seniors and $10 for students; admission is free for children 12 and younger. A four-ticket flexible subscription provides a 10 percent savings on full-priced tickets. For tickets or more information, call 630-628-9591 or visit orionensemble.org. The Czech Philharmonic Orchestra and Prague Philharmonic Choir Bring Dvorak's Stabat Mater to Cal Performances on Sunday, November 9 at 3:00 p.m.
Commemorating the 110th anniversary of the death of Czech composer Antonín Dvorák, Cal Performances presents the Czech Philharmonic Orchestra and Prague Philharmonic Choir in a rare performance of the composer's Romantic choral masterpiece, Stabat Mater, on Sunday, November 9 at 3:00 p.m. in Zellerbach Hall. The Philharmonic Orchestra, reunited with Chief Conductor Jirí Belohlávek since 2012, and the Philharmonic Choir, led by choirmaster Lukáš Vasilek, have long been celebrated for their interpretations of their nation's most beloved composer. "The Czech Philharmonic boasts a burnished and refined European sound, with a warm, string-dominated center, brilliant brass and inimitable, characterful woodwinds, which serve music of their native composers Dvorák, Janácek and Martinu so well" (Miami Sun Sentinel). The Orchestra and Choir are making their Berkeley debut. A panel discussion titled "Criticism and Creativity" will be moderated by Tim Page, Professor, University of Southern California, and held on Sunday, November 9, in Hertz Hall from 11:00 a.m. to 1:00 p.m. This panel is part of the Rubin Institute for Music Criticism, the first program of its kind focusing on music and music criticism and bringing together national music journalists, renowned musicians, and aspiring young writers. The panel will be drawn from the 2014 participating arts writers, including Anne Midgette, Washington Post; John Rockwell, writer and arts critic; Alex Ross, The New Yorker magazine critic and author; Heidi Waleson, Wall Street Journal critic and author; Rubin Institute benefactor Stephen Rubin, President and Publisher of Henry Holt & Co., whose writing credits include having written features for The New York Times for more than a decade; and Tim Page. The panel discussion is free and open to the public. For further information and a complete calendar of events go to http://www.sfcm.edu/rubin-institute. A pre-performance talk about Stabat Mater will be given by arts writer and critic John Rockwell at 2:00 p.m. on Sunday, November 9 in Zellerbach Hall. The event is free to concert ticketholders. Tickets for the Czech Philharmonic Orchestra and Prague Philharmonic Choir on Sunday, November 9 at 3:00 p.m. in Zellerbach Hall range from $36.00-$112.00 and are subject to change. Half-price tickets are available for UC Berkeley students. Tickets are available through the Ticket Office at Zellerbach Hall, at (510) 642-9988, at www.calperformances.org, and at the door. For more information about discounts, go to http://calperformances.org/buy/discounts.php. The Pacific Boychoir Academy is pleased to announce the upcoming joint concert with the Windsbach Boys Choir, one of the leading boy choirs in the world. These two world-class choirs unite for a once-in-a-lifetime concert experience, Friday, October 24 at 7:30pm at First Congregational Church in Berkeley, 2345 Channing Way. Tickets are available at PacificBoychoir.org/Windsbacher. In their 68-year history, Windsbacher Knabenchor has become one of the most popular boychoirs in Germany due to their pure, brilliant sound and invigorating performances at some of the most prestigious venues in the world. The choir will embark on a 13-day U.S. tour from October 23 through November 3 that will take them from the West Coast to the East Coast. The tour is part of a German effort to commemorate the 25th anniversary of the fall of the Berlin Wall. Along the way, the boys will perform in Berkeley with the Bay Area-based and world-renowned Pacific Boychoir. Windsbacher is known for their singing of German Romantic repertoire, and will perform the music of Mendelssohn, Brahms, Bruckner, and more. Pacific Boychoir will join in a number of these pieces and also perform American folks song and spirituals. Founded in 1946 by Hans Thamm, the Windsbach Boys Choir was brought to national and international acclaim by his successor Karl-Friedrich Beringer. 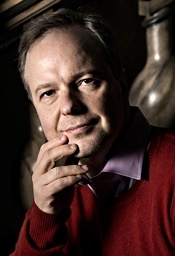 In 2012, Martin Lehmann took on as conductor of the choir, and focused on creating a synthesis of musicality, precision, and purity of sound. As a result, top orchestras, such as the Deutsche Symphonie-Orchester Berlin, the Bamberger Symphoniker, and the Akademie für alte Musik Berlin love to work with the choir. 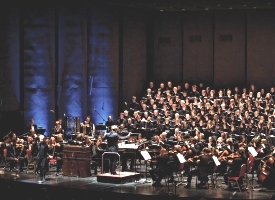 Frequent invitations to important festivals, such as the Rheingau Musikfestival and the Bachwoche Ansbach, emphasize the standing the choir has acquired in the national and international music scene. The choir's ability to deliver a beautiful, uniform tone through sacred and secular texts has drawn enthusiastic audiences in prestigious German concert halls, such as Berliner Philharmonie, Festspielhaus Baden-Baden, Herkulessaal der Münchener Residenz, as well as performance spaces throughout Europe, such as Concertgebouw in Amsterdam, Tonhalle Zurich, Palau de la Musica in Barcelona and in Luzern. The choir has the unique honor of recording with Sony Classical and has released numerous recordings, including the Mozart Requiem, Bach's Christmas Oratorio, Brahms's German Requiem, and countless a cappella recordings. "Who's that girl?" Just as the award-winning hit series New Girl follows a free-spirited and a lovably quirky young woman as she struggles to make her way in the world, New Girls introduces some of opera's most vivacious divas in their own life and love endeavors. Whether they are fiesty females like Adele (Die Fledermaus) or Susanna (The Marriage of Figaro), starlit scene stealers like Musetta (La Bohème), heart-melting heroines like Mimi (La Bohème) or Contessa (Figaro), or the ultimate new girl like The Merry Widow, they all have captured our hearts as they fall in and out of love, build newfound strength, and console each other. In his only New York appearance of the season, Hopkinson Smith performs his own transcriptions of J.S. Bach, Suites 1-3, BWV 1007-1009. Piano Concertos Nos. 17 and 24; Piano Sonatas Nos. 4, 5, and 8; various other pieces. 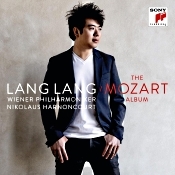 Lang Lang, piano; Nikolaus Harnoncourt, Vienna Philharmonic. Sony Classical 88843082532 (2-disc set). You'll have to forgive me, but I'm always a little suspicious when I see the name of a record album's lead performer ahead of the composer that he or she is playing. This happens a lot with superstar conductors and soloists, and it happens here as well. Chinese concert pianist Lang Lang gets his name in front of Mozart's. Perhaps this practice satisfies the label's desire to sell albums, a musician's legion of fans, and the star's own ego, but I wonder if in the long run the popularity of the musicians will hold up as well as that of the composers involved. For instance, whose name will people remember a hundred years from now: Lang Lang's or Mozart's? Anyway, there is no denying Lang Lang is a superstar and that he has a load of talent. He is one of the most-virtuosic pianists of our time. Whether he is yet a great artist may be another question and perhaps one of personal taste. Whatever the case, on the current two-disc Sony set Lang plays Mozart's Piano Concertos Nos. 17 and 24 with Nikolaus Harnoncourt and the Vienna Philharmonic on disc one and various solo pieces on disc two. All of it is excellent, of course; the question is whether the performances surpass so much of the competition that they qualify as art and that the album justifies its expense, even at the apparently reduced price at which the folks at Sony are offering the two discs. Harnoncourt may have pared down the mighty Vienna orchestra to Mozartian size, but the ensemble still sounds grand and opulent. Maybe too much so. I have the feeling Maestro Harnoncourt is more at home with a period-instruments group. After all, he has been conducting for something like seven decades, and it's been mostly with historically informed performances. Here, he seems a little out of his depth, with an accompaniment that tends slightly to overpower the scores. The consequence is a pair of performances that appear to these ears slightly too big, too monumental for the music. No such concerns about the solo playing, though. This is one of the best records I've heard from Lang, perhaps because his style appears more subdued than usual. He grasps the dramatic contrasts in Mozart pretty well, the shifts from the purely operatic to the tender and gentle. All the while he dazzles us with his finger work, so some listeners may feel the combination of Lang, Harnoncourt, and the Vienna players is almost overkill. Whatever, No. 24 comes off best under Lang and Harnoncourt's approach because it's rather theatrical to begin with. Besides, Lang's handling of the Larghetto is delicious and it alone should recommend the set. I've heard No. 17 sound lighter and breezier than this, but that's no matter. So, the question remains about competition in the concertos: Are they worth the money when there are already so many terrific recordings from the likes of Perahia, Ashkenazy, Curzon, Barenboim, Kissin, Tan, Brendel, Giles, Andsnes, Kovacevich, and many more? I suppose it depends on how big a fan of Lang you are. With the solo numbers on disc two it's another story: I have no reservations except, perhaps, about the live sound in some of them. Lang carries out his part with a consummate ease, a little hurried at times but lending a simple elegance and dignity to each piece. The set ends with an encore of the Rondo Alla Turca, which Lang plays at a breathtaking pace. Although it makes for a whirlwind finish, it seemed a mite like showing off, and I couldn't really enjoy the music taken so fast. Producer Martin Sauer and engineer Julian Schwenkner recorded the concertos at the Goldener Saal, Musikverein, Vienna in April 2014. Producers Martin Sauer and David Lai and engineers Tony Faulkner and Jean Chatauret recorded the solo pieces at the Royal Albert Hall (live) and the Salle Colonne, Paris in November 2013 and May 2014. The sound field in the concertos places the pianist dead center, with the orchestra spread out around (or, technically, behind) him. The sonic result is a touch close yet reasonably lifelike, a bit soft in the midrange, mildly reverberant, and always rich and luxuriant. I noticed nothing untoward about the sound, no brightness, forwardness, or hardness. Perhaps it could have been a tad more transparent, but that's a relatively minor issue in sound so comfortable and easy to listen to as here. Dynamic range and impact are fine as well, and there's a pleasant bloom on the instruments. Unfortunately, the sonatas on the second disc do not benefit from the live sound the engineers afford them. While the piano sounds great--clear and resonant--one is always aware of a low background noise throughout the performances and a shifting, coughing, and wheezing from the audience. At the conclusion of the third sonata and again at the end of the program, one hears an eruption of applause. I found it distracting. Music of Barber, Corigliano, and Bates. Anne Akiko Meyers, violin; Leonard Slatkin, London Symphony Orchestra. e-One Music EOM-CD-7791. 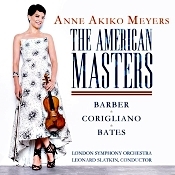 It's hard not to like anything Anne Akiko Meyers plays. She has such a gentle touch on the violin, she makes every piece of music a pleasure. And so it is with the three American works on the present album: the Concerto for Violin and Orchestra, Op. 14 by Samuel Barber (1910-1981); the Lullaby for Natalie by John Corigliano (b. 1938); and the Violin Concerto by Mason Bates (b. 1977), Maestro Leonard Slatkin and the London Symphony Orchestra in accompaniment. Corigliano in his booklet notes points out that there is a bond of friendship among the three composers on the disc: Barber was Corigliano's mentor, and Corigliano was Bates's mentor. Therefore, the music has deeper connections than one might suppose. First up is Barber's Violin Concerto, which he wrote relatively early in his career (1939) and which subsequently became one of his most-popular works. It later even became the basis for a ballet. The music is exquisitely beautiful, at least its first two movements, with Ms. Meyers emphasizing its long, flowing lines and rhapsodic melodies. Then comes that famous final movement that seems to have little in common with anything that went before. After the lengthy, relaxed line of the second movement fades out, the Presto finale enters on an agitated note. Barber marks it as "in moto perpetuo" (in constant or perpetual motion). Apparently, he meant it as a virtuosic piece for a young violinist who complained that the first two movements were "too easy." Well, the fact is, for Ms. Meyers the final movement sounds easy, too, she plays with such graceful dexterity. Nothing seems beyond her reach, yet even though the finale is fiery, she integrates it well with the opening movements. Yes, it's fast and furious; no, it's not so disjointed as it can sometimes appear. Between the program's two violin concertos we find Corigliano's Lullaby for Natalie, a piece Ms. Meyer's husband asked the composer to write for Ms. Meyer's yet-unborn child. The lullaby is also exquisitely beautiful. Corigliano jokes that it put Ms. Meyers's baby to sleep so it must either have bored her or done its job as a lullaby. I doubt that anyone could play it any better than Ms. Meyers does, given its reasons for being. The album concludes with a world-premiere recording of Mason Bates's Violin Concerto, which the composer says represents the violin as a kind of primeval, ancient animal. Huh? Well, he suggests that the sound of the solo violinist "inhabits two identities: one primal and rhythmic, the other elegant and lyrical. This hybrid musical creature is, in fact, based on a real one. The Archaeopteryx, an animal of the Upper Jurassic famously known as the first dinosaur/bird hybrid, can be heard in the sometimes frenetic, sometimes sweetly singing solo part." So, we go from the Romantically angelic music of Barber to the more-eccentric music of Bates, with Ms. Meyers making the transition so gracefully, you'd hardly know it was happening. Anyway, the Bates music is all blocks and angles next to the smooth curves of the preceding works. The Bates is like printing compared to cursive writing. Still, despite its eruptive style, when Ms. Meyers enters she brings the music back to earth, straightening some of the corners and underscoring the otherwise latent lyricism of the rhythms. I especially enjoyed the quiet, sometimes eerie, continuously lovely mood of the second movement, "Lakebed memories." Moreover, the sweep of the bird flight in the finale also sounds quite fetching. Incidentally, with Ms. Meyers so dominant, I almost forgot to mention the conductor and orchestra. Maybe that's because they simply do their job, never overshadowing the soloist, staying in the background for support. But support they do, wonderfully unobtrusive, providing an accompaniment that always keeps the soloist in the forefront and maintains the atmosphere of the music. Producers Anne Akiko Meyers and Susan Napodano DelGiorno and engineer Silas Brown recorded the album at LSO St. Lukes, London in September 2013. The sound is very smooth, very luxuriant, yet with good definition, range, and impact. It has a soft, natural roundness about it that is quite flattering to most of the music. It's not exactly audiophile material, just comfortable. It's also a little close, with a minimal amount of orchestral depth, but the violin appears well positioned within the instrumental framework, and the frequency response remains well balanced.